How to play and watch your dynamic SWF Flash Picture Gallery slideshows into Microsoft PowerPoint (2003, 2007, 2008, 2010) Presentation? It seems very cool for users to put a playable Flash animation videos on PPT to watch. Many PowerPoint users all like to upload and insert a SWF file with Slideshows in their PPT Presentations, but they do not know how to do that. Embed a SWF file with slides can make your PPT presentation look more attractive, but you need to create the album slide shows in SWF format before you import it. Microsoft PowerPoint allows users to add or import a Macromedia Shockwave Flash Object Control into a slide in PPT presentation. With this Macromedia Shockwave Object component, you will easily add and import your SWF flash animations into PowerPoint 2003, 2007 and 2008, 2010. How to create digital Photo album Slide show animations and embed into PPT to watch on Microsoft PowerPoint 2007, 2008, 2010 or previous versions like 2003? You need to make a SWF file with picture gallery slide shows at first. 3D Flash Slide Show Maker is an ideal SWF Image album slideshow Maker for PPT users to create their dynamic slide show animation presentations easily. With this Gallery animation creator, you will easily create your own dynamic picture slides for adding inside to PowerPoint(2007, 2008, 2010 and 2003) presentations. How to import and embed the creative animation videos files in Microsoft PPT presentation? Before you import and upload Flash Object file, make sure the Flash Object Player is installed on your computer. 3. 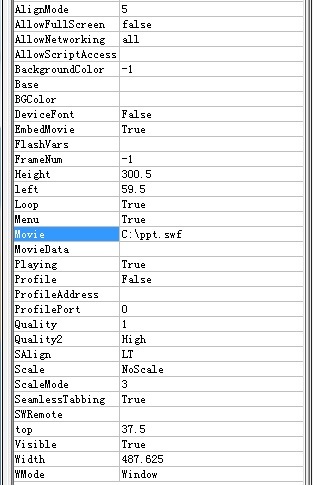 Please right click the control to choose “Properties” and go to the “Properties” window, where you can add the related information for movie. 5. To make the Flash animation slideshows play automatically when the PPT presentation is viewed. You need to set the “Playing” as “True“ if you want your animations play automatically. To embed the video movie animations into PowerPoint, you need to set “Embed Movie” as “True”. 6. 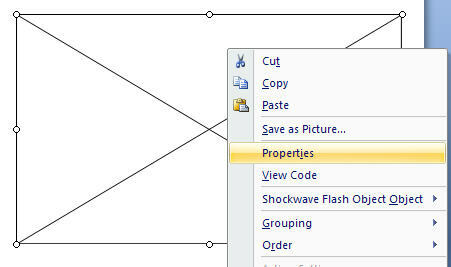 When all is ready, you save your presentation and close the “Properties” window. On the View or Slide Show tab, you can preview your Microsoft PPT presentation with movie slideshows.